More than 60kg was the consensus. The hostel proprietor and his brother were taking it in turns to lift my bike, now loaded up and ready to roll. They might have been right. A 5-litre jerry-can of water was resting on the front rack – the latest addition to the black behemoth. I’d found it in a nearby market, alongside a pile of other re-cycled containers. It had once held vegetable oil, but seemed to be well cleaned out now. In Morocco and Mauritania it is common to see empty plastic bottles and containers at the roadside. Here in Senegal people collect and re-sell them. It’s a pity they can’t do that with the plastic bags. They’re everywhere. It was good to get back on the road, although the thefts in St Louis had left me a little paranoid and dis-trustful. It’s not a good frame of mind to be in when you’re travelling alone and need to depend on the kindness of strangers. I shut myself off for most of the day with the Ipod. Kids called out at the roadside. I waved and occasionally removed an ear-piece to hear the words “Toubab, Toubab” (white man). Away from the coast the wind died and the temperature increased. Villages slept under the brilliance of the mid-day sun. The landscape appeared harsh and half-desecrated, until late in the afternoon when the shadows began to lengthen and the light softened. By this stage my water finally began to cool down. Contained in plastic bottles and the jerry-can it heats up to an unpleasant temperature under the sun. Someone suggested using hessian sacking to wrap around the containers. I must keep an eye out for this. There was little to detain my interest as I pedalled south, until an enormous Baobab came into view. 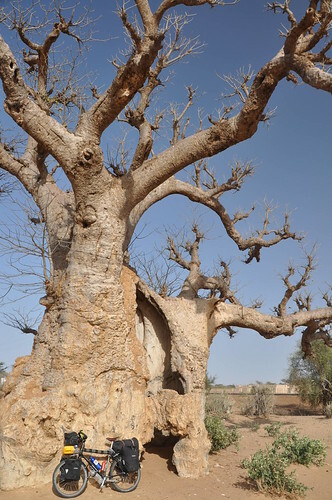 Rising out of the savannah like prehistoric guardians of the land, the Baobab is a distinctly African tree. It’s branches resemble roots – the African myth being that when God made the world he gave each animal a tree. The Baobab was given to the hyena, who threw it down in disgust. Hence the reason it’s also known as the ‘Upside Down tree’. The trunk of this particular Baobab was hollow. You could walk inside. I wheeled my bike across the sand and woke two nearby curio-sellers. They were dozing in the shade of some make-shift shacks containing carvings and masks. Had I arrived on four wheels they might have begun a sales pitch. They regarded me without moving whilst I admired this ugly yet majestic monster. An hour later a dark mass of moving objects half-blocked the road. 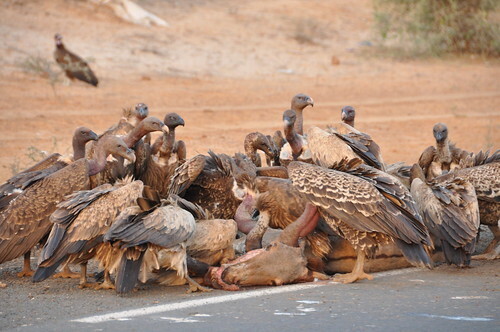 A colony of vultures were feeding on a dead mule. I stopped to watch and listen to their angry squawking. These piranhas of the sky were ravenously devouring the beast. The sound of it’s skull being lifted and slammed back on the road was audible 20 metres away. They paid me scant attention as I slowly wheeled passed. The road was free of traffic now. I’d turned off the highway in Kebemer and opted to detour west to the sea. My map depicted a small track running south from the coastal village of Lompoul sur mer. The idea was to follow it and re-connect with more minor roads leading into the capital, Dakar. The track didn’t exist. Second opinion reached me in French, Wolof and Pular. The latter two languages are spoken widely throughout Senegal and neighbouring west African countries. A few words go a long way. I had 4 hours of practice. It seemed that rather than heading back the way I’d come it was possible to use the beach as a road. I just needed to wait for the tide to turn. I didn’t think it would be possible to cycle along the beach. Local opinion differed. My Wolof/Pula speaking company were right. The sand and salt might not be good for the bike, but with wide tyres I pedalled south, following the line of the wash.
For most of the next 40km the beach was wide and empty. Several horse-carts trotted passed, their passengers waving with looks of bemusement. Pirogues pulled up on the sand and small buildings disappearing into the undergrowth denoted a village. None appeared on my map. Those that do are effectively towns in comparison. Children played football along the beach beside these villages. There were hundreds of them – children that is. It is something any visitor to Senegal will notice very quickly. Approximately 45% of the population of this country is below 15 years of age. Children are everywhere and there appears to be no limit on the size of families. It is the same in many African countries. In St Louis I had spoken with a man who wanted me to buy him some milk . He had explained he had 3 wives and more than 10 children. Your decision I told him. It doesn’t sound very sympathetic. It wasn’t. Occasionally the game of football was more interesting than the Toubab cycling along the beach. At other times it seemed more interesting to chase the toubab and pull on his bike. The children did this until a nearby adult shouted something at them. I left the beach shortly before sunset. 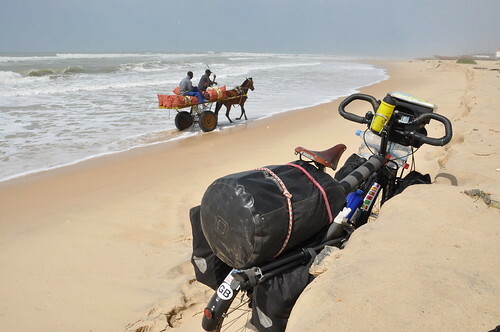 I would have happily carried on, and I later heard it was possible to travel all the way to Dakar itself this way. Better to be on a road than stranded on the beach at high-tide with no fresh water though. A solitary acacia tree had been company for my tent the previous night, but this time I ended up in a small Pular speaking village. The headman had been standing on the road as I passed. A simple meeting of eyes, a small smile on his face as we observed each other – it was enough for me to decide that I would ask his permission to pitch the tent in the village. It was less a village and more a small compound of about ten straw huts. No electricity, no water. There are thousands of places like this in Senegal alone. Excitement ran through the air. 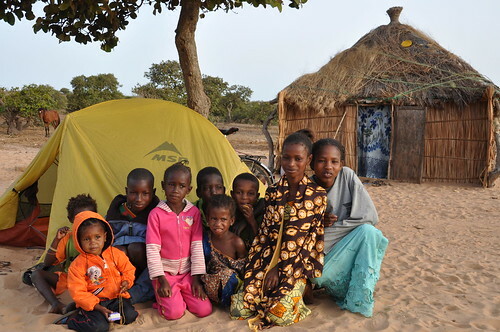 Children ran to watch the sweaty toubab pitch his tent. I expected yells and demands for gifts. None came. Tea was served in the headman’s hut, and dinner later served to me in my tent – rice with fish. A cockerel woke me in the morning, along with several donkeys. The headman was dressed in a long blue kaftan (boubou) and explained he was leaving for the day. I offered a few thousand francs. At first he seemed shocked and half -embarrassed to accept, but soon took them. My camera provided much amusement with the children, before I finally pulled myself away and was given a big wave-off. Dakar soon began to sweep me into her bosom. The city lies on the tip of a peninsula that stretches west into the Atlantic. I’d hoped that the smaller roads would avoid the throng of traffic that people had pre-warned me about. They didn’t.Villages merged into suburbs of the city and the roads filled with cars, trucks and colourful mini-buses. There are few driving rules. I’m staying with teachers from an International School here. The hospitality of people never ceases to amaze me at times. 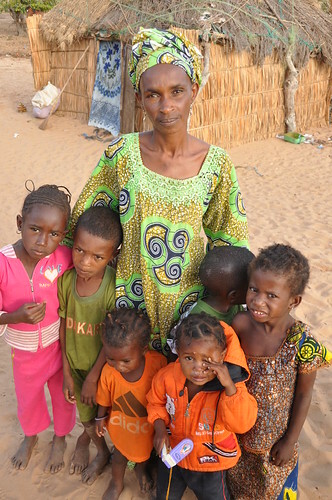 Their world is different from mine, and different of course from the Senegal I’ve experienced to date. I’ve spoken to a number of classes here about my two-wheeled travels. It’s been an opportunity to share the experience, and promote awareness for the Against Malaria Foundation. One of the presentations was filmed. I ‘ll share some of the footage here in the next few days. As always, if anyone has recommendations, advice, criticisms, questions – about this post or whatever, please don’t hesitate to leave a comment. Don’t forget you can receive this update as an e-mail, by subscribing to the newsletter, as well as follow me through twitter and facebook. A co-worker told me about your adventure and I found it very fascinating. First of all, in behalf of all african folks, I want to thank you for the good cause. I was born and raised in Dakar and I have been living in the U.S.A. for about 6 years now. I was really shocked about all these incidents that occured in Senegal but I just wanted to tell you to keep your head up and know that others support you and appreciate what you are doing. From now on, I’ll be following you on your journeys, and I hope to see more pics from the african continent. fait beaucoup attention a toi. Glad to hear you’re ok Peter after your confrontation in St Louis. The old fasion way of keeping barrels of beer/cider cool in the summer was to cover them with wet hessian sacks, should work for you water bottles as well. Good luck. As an occasional touring cyclist with aspirations to go further, I have been enjoying your account of the trip and having read your tweets this evening, I’m really sorry to hear about the machete incident. I hope you get well soon and that this doesn’t put of you off the rest of your trip. I can’t tell from your photograph: are you using special clipless pedals and shoes, or more conventional footwear and ‘normal’ pedal – with or without toes-clips/straps? And is this the same as you used on your last trip? I’m interested because your feet and ankles must be exposed to quite a lot of stress moving that bike around. Normal pedals with normal sandles. No different to last trip. I thought about clipping myself in, but I spend quite a lot of time off the bike. I have just enjoyed reading your blog and hearing about your latest adventures! Looks like you’re having another exciting journey! I expect your last trip seems a long time ago now….and Japan even longer ago! 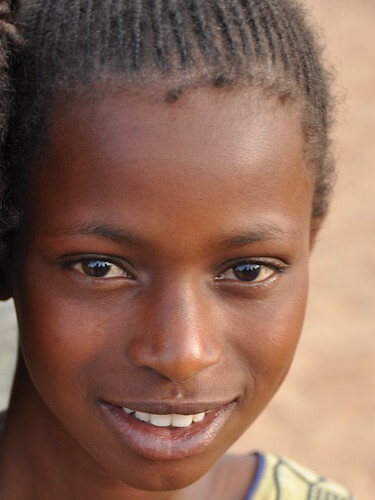 Hey Peter- It’s Taryn from ultimate (wolof book). You weren’t the only one to leave ultimate with some bruises! Anyway, I’m thrilled to follow your adventures through Senegal and beyond- I would like to do this on a small scale sometime after college so I’m interested to see how it works. If you’re still thinking about visiting Ginak Island, shoot me an email before you leave Dakar and I will give you some contacts in Kanuma and Kadjiata (the village on Ginak) so you can arrange cheaper transportation to and from the island with your bike and maybe have even better access to some cultural experiences. I’m sure you’ve heard this but a small glitch that we ran into was never officially crossing the border with visas, stamps, etc. The Gambia border officials are notoriously… “vigilant” about this for when you cross into the Casamance. But the people on Ginak are great and the beach there is a great place to camp if you can work it out! 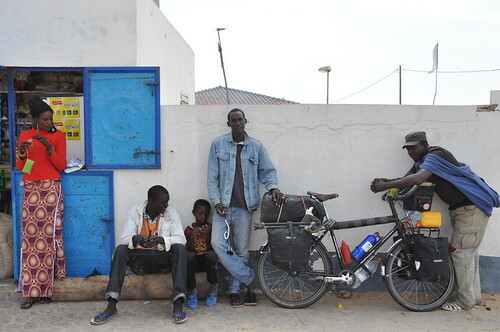 If you plan to take a detour down the Senegal coast, hit up my friend Chris in Palmarin, a PCV. He could probably hook you up with some hyenas, the salt extraction wells, exotic birds, Sereer lessons, a bucket shower and a great place to camp on the Senegal side of the Siné-Saloum Delta. Good luck with Wolof and the next leg of your trip! Cheers Tom, How’s that D90 treating you? You’re always welcome to join me on the road as I continue south – increasingly far away from Armenia though. Great documenting of your adventures, Peter. Loving following you! Yes, cycling into and out of big cities is one of the worst aspects of cycle-touring, IMO… getting lost amidst the inner city mayhem is no fun! Good luck with the cycle out of Dakar… shees, 40km of it… “Put-your-head-down-and-grit-your-teeth” kind of thing. For how long are you going to stay there? Big, sprawling – yet to really explore. Heading off to a nearby island tomorrow. Wish there was an easy escape out of the city – huge highway for 40km. It’s good to hear everything’s fine. How is Dakar?